: The origin of this breed of hound, native to Istria, is ancient beyond memory, Frescoes (1474, chapel dedicated to St.Mary at Beram, near Pazin), paintings (e.g. Titian, early 18th century) and chronicles (1719, Bishop Bakic of Djakovo) bear witness to the smooth-haired Istrian Hound’s antiquity. Owing to its excellent hunting qualities, it was exported from Istria to neighbouring regions. The first entries in the stud-book date from 1924. FCI accepted the breed in 1949, but it was not until 1973 that the first standard for the breed was published. Today, the short-haired Istrian Hound is frequently encountered in Istria and neighbouring regions, where hunters still appreciate it highly on account of its outstanding qualities. : Noble appearance with its snow-white coat broken by lemon markings. Short fine coat. Long narrow clean head. Supple body. Thin tail carried slightly curved like a sabre. Scent hound with a persistent baying, sharp, sonorous tongue. : Body length should be more than 10% greater than height at withers. : Gentle, docile, calm and very attached to its owner. Lively and enthusiastic when hunting. : Length of head varies from 20 to 24 cm. : Seen in profile, the occipital protuberance is pronounced and the frontal bone is slightly rounded. Seen from above, the frontal bone is elongated and rather narrow with an obvious frontal furrow. : Slight, with no abrupt break. : Black or at least dark brown. Wide-open nostrils. : Long, broad at its base, tapering progressively towards the nose. Nasal bridge is straight. : Oval, neither sunken into sockets nor prominent. Iris colour as dark as possible. Lids black or brown. Bright eyes, full of expression. : Thin, broad set-on, a little above the level of the eyes, narrowing towards the tips. They are considered long if, when drawn forward along the muzzle, they reach the canine teeth. They should be at least semi-long, reaching to the superciliary arches. : Strong, slightly arched at the nape. The junction with the head is noticeable at the rear of the occipital protuberance. The neck is powerful and set obliquely into the body. Length: From the occipital protuberance to the withers, the neck measures between 15 and 20 cm. Skin: Taut, without dewlap or wrinkles. : The topline slopes gently from the withers to the croup. : Level, broad and muscled. : Long and broad, horizontal or very slightly sloping, longer in females than in males. The hips are hardly perceptible. At the top of the croup the height should be about one finger’s breadth less than at the point of the withers. : Well let-down, it reaches at least to the elbows. Usually its circumference is about 12 cm more than the height at the withers. The ribs are well sprung. The chest is well-developed but the point of the sternum is hardly visible. : The underline rises gently from the sternum to the groin and so the belly has a slight upsweep. : Strong at the root, tapering towards the tip. The more slender the tail, the more noble the dog appears. 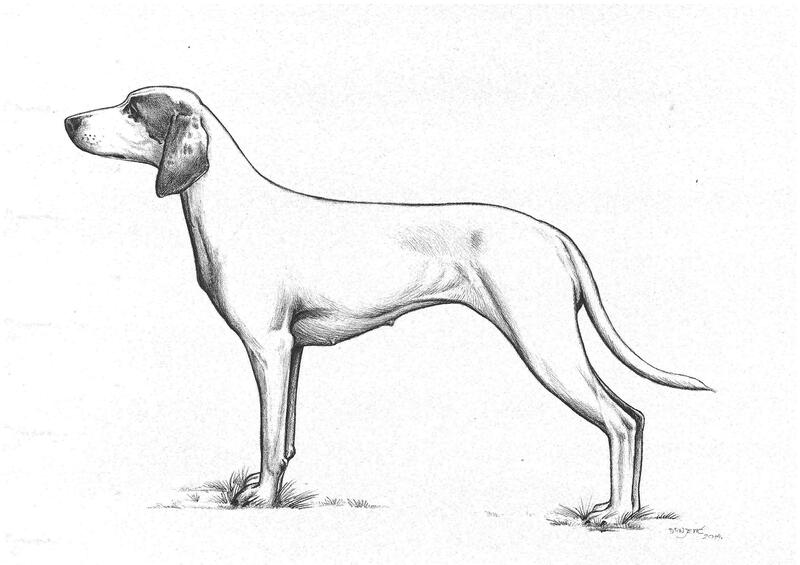 Set on high, of medium length and rarely reaching below the hock joint. The tail is slightly curved upwards. : Long, sloping, muscled and well-attached to the chest. : Difficult to distinguish from the forearm. : Straight, short. It can be slightly sloping but the angle with the vertical is never more than 10%. : More like cat feet than hare feet, light with tight toes, pads rounded and firm, solid nails. : Similar to front feet but slightly longer. : Seen from behind, the thigh, the leg, the hock tendon and the metatarsus are all on the same vertical axis. : Patella broad and high set. : Long, sloping and well-muscled. : Short, upright or very slightly sloping, forming an angle of 10-12 degrees with the vertical. : Supple, close-fitting over all the body, with no folds and no wrinkles on forehead. Pinkish in colour. : Short, fine, dense and glossy. Sometimes longer on the back of the thighs and on the underside of the tail but this is not sought after. : Ground colour snow white. Ears are usually orange, colour which goes beyond the base of the ears and reaches over both sides of the frontal bone as far as the eyes, giving the head its typical mask. A star is mentioned if there is a small or large mark of the same orange colour on the top of the forehead. The ears can also be speckled with orange marks, something which is particularly prized and is seen as an indication of pure breeding. Spots of lemon/orange more or less widespread, in fleckings or in ribbons can be found anywhere on the body but most often in the area at the root of the tail. These spots must never be so numerous as to impinge on the white ground coat. The actual tint of the spots must be pronounced, neither pale nor dark nor even brown, any of which would indicate cross-breeding. The presence of a third colour is unacceptable even if there are only a few hairs of this colour. The coat can also be totally white with no spots at all. Ideal height for males 50 cm. For females 48 cm. : Ca. 18 kg for an adult male. Any colours present except lemon-orange. Greyish or blackish markings highly undesirable.